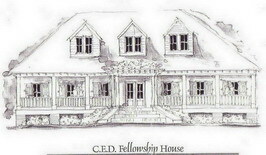 Directions to CED Fellowship House, Inc. from Fort Payne, Alabama. Take I-59 South to Attalla/Rainbow City Exit (Take Exit). At bottom of exit you will be across from Cracker Barrel Restaurant…..turn right onto HWY 77, go to third traffic light and turn left onto Brooke Ave……First House on Left just past Averitt Express. Fellowship House is first house on your left – just past Averitt Express. Hwy. 431S - turn right on Hwy 77. Follow Hwy 77 through Attalla, cross over I59, and turn left on Brooke Ave. (Third traffic light). Hwy. 278E to Hwy 77S. Turn right. Follow Hwy 77 through Attalla and after passing over I59 turn left on Brooke Ave. at third traffic signal. Fellowship House is first house on left – just past Averitt Express. Hwy. 278W and/or 431N to Gadsden. Becomes Meighan Blvd. Follow Meighan through Gadsden & turn left on I59S towards B’hmn. Turn Right at first exit to Hwy 77. Turn Right on 77S. Cross over I59 and turn Left at third traffic signal on Brooke Ave. Turn right on Hwy 77S. Turn left on Brooke Ave. at second traffic signal. Follow Meighan Blvd through Gadsden. Turn Left on I59S towards Birmingham. Take first exit to your Right to Hwy 77.